Hydraulic Fracturing or "Fracking" is a new technology that has opened up immense resources of natural gas buried in deep shale beds. Some see it as the answer to the energy crisis and a chance at energy independence. But fracking has become an incredibly divisive issue ripping apart communities and even families. The backlash is unprecedented, with states and countries adopting fracking bans. Is fracking that bad? Or is it truly an unexpected gift of energy, jobs and economic boost? Shattered Ground travels from the northern gas fields to the rancorous political battles and into the hot beds of shale gas activity looking at the people who benefit, and those who do not. New scientific data is only now clarifying a complex issue and showing where there are health and environmental concerns on a scale that has never been seen before. Shattered Ground is a one hour documentary that looks past the rhetoric and emotional arguments to find the real issues involved in Hydraulic fracturing, the opportunity, and the potential health and environmental issues that could affect us all. 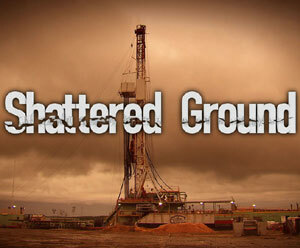 Shattered Ground is produced by Zoot Pictures Inc. in association with the Canadian Broadcasting Corporation.